I remember when I was a child… or maybe I’ll be poetic and say, “I be remembering when I was but a wee tyke”. No, that doesn’t work. I feel like I should be wearing a Leprechauns outfit and eating Lucky Charms. So… I remember when I was a child, back in the Stone Age. Every Autumn our school would start selling caramel apples, or “Affy Tapples” as they were named. Yes, that was the specific brand name. I think they are still available in the Midwestern area. I always loved when they came around. End of the school day, there people would be, small booth set up in the school lobby, selling Affy Tapples for 25 cents. I would wager that the kids today pay a dollar or more for theirs; damned inflation. But, I would go there, tarnished quarter grasped in my dirty little hands and then I got it…. that much loved apple. Is there anything better in Autumn than a caramel apple? You get that tart juicy apple dripping down your chin, a blanket of sweet chewy caramel that gets stuck in your teeth and then the crunchy peanuts. The perfect treat when it comes to a mix of flavors and textures. I wanted to recreate that experience with this bread, with one exception. I don’t use nuts a whole lot, one, because I am not a huge fan, though I have my times when I like them and two, I just can’t eat them much anymore, what with aging teeth lol. So no nuts in this bread. You could easily add a half cup or so of your favorite nut (would have to be salted chopped peanuts to be authentic though) to the batter. This is a really good quick bread that goes together fairly quickly. One tip though- don’t shred your apples until just before you get to the step of adding the flour to the batter or they may have time to turn brown. It doesn’t take long for an apple to oxidize at all. Sweet, moist, great for dessert or a quick breakfast. Have some hot coffee waiting, or tea if you’re like me, and enjoy. Make your streusel first and set it aside until ready for it- In a small bowl, combine the brown sugar, flour and cinnamon. Using a pastry blender or your fingers, cut in the softened butter until the mixture is crumbly. In a medium bowl on low speed with a hand mixer, beat the butter until creamy. Add in your sugars and beat well. Add in the eggs and vanilla extract. beat well. Dump in the flour, salt and spices. On low speed, mix just until combined. Gently fold in the caramels, the apples and the raisins. Pour the batter into the prepared pan. Sprinkle the top of the bread with the streusel. Bake at 350 degrees for 60 to 65 minutes or until a skewer inserted into the middle comes out clean. A small bit of moist crumb is ok; liquidy is NOT. Let cool in the pan for about 20 minutes, then turn out onto a rack to finish cooling. Be aware, this one is touchy to unpan due to the streusel. Make sure you have it totally loosened before trying or most of the streusel is going to end up on your counter and not on the bread. 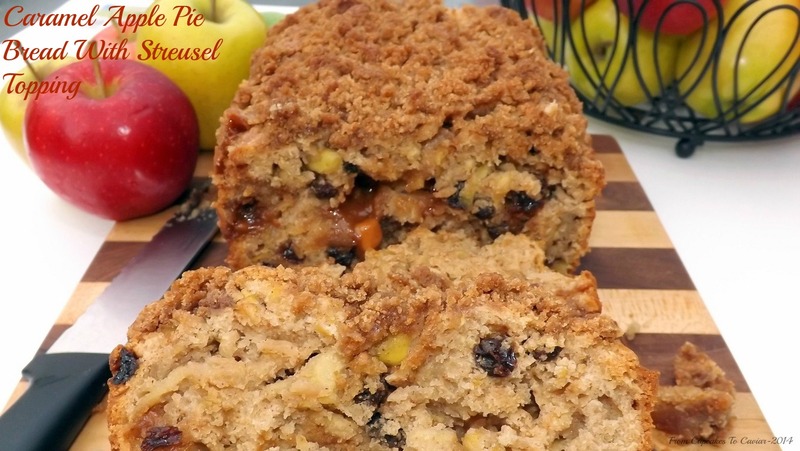 This entry was posted in Apples, Breakfast, caramel, Desserts, Easy, Quick Breads and tagged apples, caramel, easy, quick bread by Janet. Bookmark the permalink. What could I use in place of the Werthers caramels? We don’t have them here.